We had our family over for Canadian Thanksgiving the other weekend and Hubs and I made a giant turkey dinner all by ourselves for the very first time. Safe to say dinner was a bit later than we expected because the turkey wasn’t looking so cooked at meal time, but otherwise I think we did a pretty good job. Thankfully I had made a loaf of my homemade bread, so everyone snacked on that while dinner was still in the oven, and the feedback I got about the utter deliciousness of the bread made me realize - OK, this needs to be shared to as many people as I can reach! It is literally 4 ingredients, vegan, and so easy a monkey could do it. Guys, I am still improving my game in the kitchen and this is one thing you cannot screw up - trust me! It takes 5 minutes of actual work IF THAT and is the best tasting bread I’ve had, and you know exactly whats in it, unlike what you purchase at the grocery store. I first found this bread recipe on jocooks.com but I like to change it a bit by sprinkling some spices on the top, and I also want to try making a garlic bread version of it - stay tuned for that! Mix together all dry ingredients in a large glass bowl. Once they’re all in, take the water and slowly start to stir all the ingredients together making a sticky dough. Be careful not to add too much water, depending on your climate you may need a bit more or less so be sure to stir in slowly. Once the dough is in one somewhat sticky clump, cover with plastic wrap and a tea towel and leave for 12-18 hours. 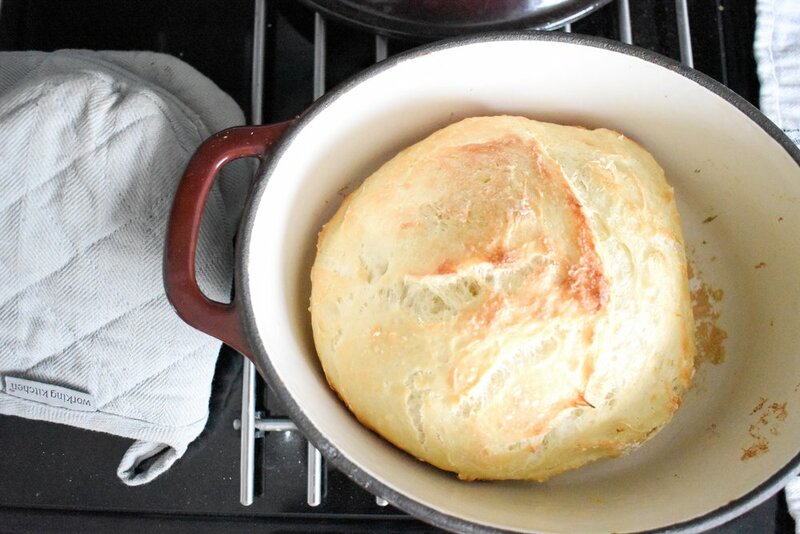 Once you’re ready to bake, preheat the oven to 450 degrees and put your dutch oven in there to heat up with the oven. Once heated, sprinkle some flour in the bottom of the dutch oven and put some on your hands so the dough sticks to you less. Then place the dough in the dutch oven, and bake covered for 30 minutes, then 10 minutes with the lid off. Once it is finished in the oven, put on your oven mitts, remove the loaf from the dutch oven and let cool on a cooling rack. And that’s it! Serve this bread to your kids or your next party and people will be shocked that you made this yourself. I love it with spicy hummus, I’m sure it would make amazing avocado toast, you name it!